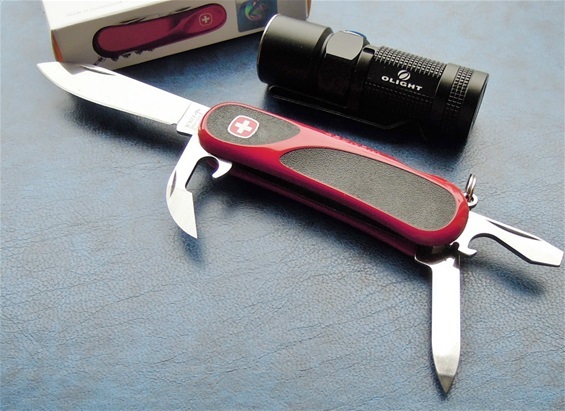 Here is my latest Wenger SAK and it is an EvoGrip 10. It is a very old tool configuration that you will find in a huge number. The EvoGrip 10 is probably the best developed of all with such a tool configuration. In the everyday life one need small devices that are helpful and take little space. 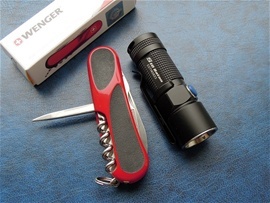 In the everyday life a flashlight and a SAK represents two very helpful devices to me. All kinds of different hobbies and tasks require this. There is a saying that “tools do half the job” this is true! The quality of “half the job” requires good products. With the introduction of LED flashlights a new world was opened. I am glad that I am one of the people on this earth that was part of this revelation. 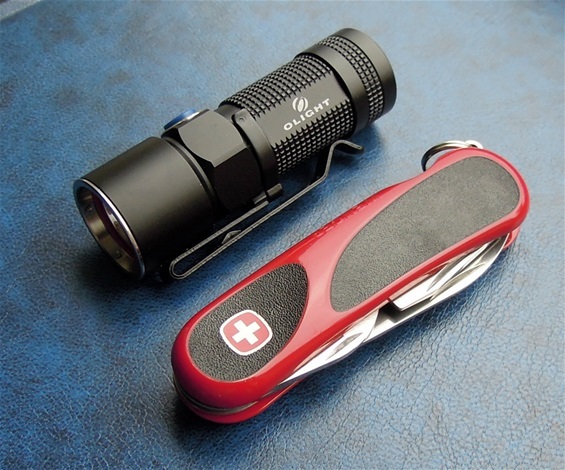 The little Olight S10 Baton got the Cree XM-L2 LED and produces much light in a very small package. 400 Lumens are just an indication but it does give a surprisingly good light. It got a magnet in the tail cap and it is a strong magnet not a weak one that barely attach. Also an indication that the designer understands flashlight-use is that the magnet can be removed. The settings are also fun and easy to use. The memory from the last setting is also very helpful. One CR123A is all that it needs! The medium mode setting is the one I have used the most and this is also more economic for the battery lifetime. There is one important variation with the grind on the EvoGrip 10 knife. Usually there is a distinct angle towards the tang. This is very common to find on the Evolution and Grip knives. On this there is only a small angle and i could jump to a conclusion with production variations. If you look on Wenger SAKs before the evolution and new products this was used. I wonder why this reappears now? Then i checked the new Victorinox Delemont knives and yes this new grind appears on them too. So it could be that this EvoGrip 10 is a bit more interesting. It is marked 01 2013 and it is January 2013. No matter the reason for this new grind it is there and it represents a change after 2012.